NAS units targeting home consumers have traditionally been underpowered in terms of hardware as well as firmware features. Low power, reduced cost and media-centric features are primary requirements in this area. Intel has traditionally been loath to participate in this market segment, probably due to the obvious lack of high margins. However, the explosive growth potential in the consumer / SOHO NAS market has made Intel rethink its strategy. The Atom CE5300 series was initially introduced as the Berryville set-top-box platform in March 2012. Almost a year later, the CE5300 series was re-launched in its Evansport avatar as a storage solution targeting home consumers (in particular, as a media server platform). Asustor, Synology and Thecus were touted as partners building NAS units based on this platform. We have already looked at the 2-bay Evansport model from Thecus, the N2560 and the Asustor AS-304T. Today, we will look into what Synology's Evansport offering, the DS214play, brings to the table. The DS214play is currently the only Evansport NAS from Synology available to the general public. The specifications of the DS214play are summarized in the table below. NAS vendors designing products based on Evansport have hugely been influenced by the platform's STB background. Both the Thecus N2560 and Asustor AS-304T sport HDMI video output, implying a usage model with the device connected to a television or entertainment display. It is a matter of personal preference as to whether one wants a NAS connected to the TV in the living room, but Synology felt otherwise. Instead of equipping the DS214play with a HDMI port, they decided to retain the core functionality of the NAS and put the media-centric features of the SoC to use elsewhere. The DS214play is targeted heavily towards media enthusiasts. Synology's landing page heavily trumpets the presence of a hardware transcoder engine. Transcoding (in the process of acting as a media server / DLNA DMS (Digital Media Server)) is one of the often requested features from a NAS targeting home consumers. The DS214play's uniqueness within the Synology lineup is brought out in this FAQ. In the rest of the review, we will cover the hardware aspects of the DS214play and provide some setup and usage impressions. This will be followed by benchmarks in single and multi-client modes. For single client scenarios, we have both Windows and Linux benchmarks with CIFS and NFS shares. We will also have some performance numbers with encryption enabled. There will be a few sections dedicated to the DSM features relevant to multimedia enthusiasts. In the final section, power consumption numbers as well as RAID rebuild times will be covered along with some closing notes. Prior to all that, we have a summary of our testbed setup and testing methodology. 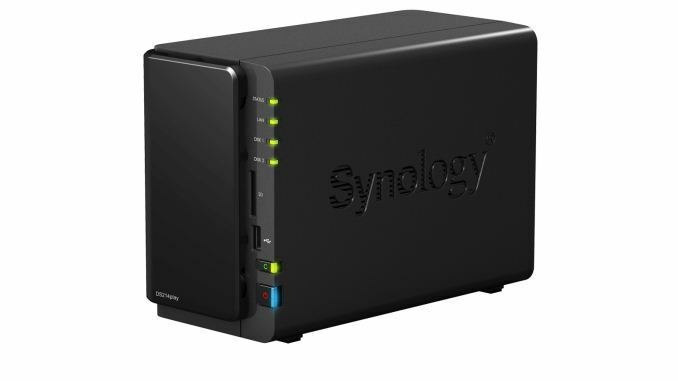 The Synology DS214play is a 2-bay unit. Users can opt for automatic SHR (Synology Hybrid RAID) protection or manually set the RAID level to 0 or 1. We benchmarked the unit with SHR (which is effectively RAID-1). We used two Western Digital WD4000FYYZ RE drives as the test disks. Our testbed configuration is outlined below. Maybe I'm just not the target market for this kind of device, but I am always left scratching my head on the value proposition of something like this. For roughly the same price, I could build a micro-ATX rig with twice (or more) the SATA ports, a higher-power CPU, optical drive capability, and more USB/USB3 ports. Plus, the custom build could also be an additional home PC, from which you could run a Plex server, and/or host your mySQL database for XBMC. I always find myself reading AT reviews on NAS boxes with the idea that I might want one. Then I look at the price and compare to the functionality of my current W8.1-based home server and the two aren't even in the same league. Power consumption can't be it (my W8.1-based home server consumes 31W at long idle). Network throughput can't be it (I get 900Mbps over my home network moving files between PCs). I also don't understand. I want something other than ext4 as well. If I'm going to store lots of data long-term I want reliability to be the name of the game. I ended up building a server around a Xeon E3 with ECC memory and 6x drives. Then installing FreeBSD on it with the storage drives running ZFS. It cost similar to a midrange Synology box, but it is better in every way. This. These things look bad from a financial aspect if you're thinking of purchasing one as an individual where you undervalue your time.. But in terms of a business, you can burn through $370 in an hour, if not a few minutes. You can spend 5 minutes to buy this and 10 minutes to set it up when it arrives and get it up and running. Or you can spend an hour picking out and ordering the parts for a custom box, then spend an hour assembling it, then 2 more hours installing software, setting it up, and testing it. Usually at that point a business has burned more money on labor than it would've spent on this one-stop solution. Case in point, one example where it makes sense as an individual is if I want to set up my parents with a NAS. I don't want to remotely troubleshoot it and have to babysit them through fixes every time something goes wrong. I want it to be dirt simple to set up, and have a proven track record of reliability without continuous monitoring and management. The time it saves me from having to fix or tweak it at my parents' house can easily be worth $370 to me. I have the ability to build a seriously nice HP Microserver with encryption, trascoding streaming, and all that good stuff, too - and it'd cost the same, more or less, as one of these devices, if you don't include my time at chargable rates. I'm a multidisciplanary IT admin/troubleshooter - I'm the sort of person who can singlehandedly build an entire office infrastructure including GPO'd domain (or Puppet'd Linux environment) from scratch given the funding and a few days of time. So I'm not niave about this. Admittadly, no transcoding (the Play wasn't available at the time, and the DS713+ was a bit much for my needs and budget), but handily, Chromecast and VideoStream do that nicely using my laptop as a proxy. Does everything I need to, very nicely, with absolutely sod all maintenance or tweeking required, it'll happily WOL and sleep, can talk to UPS/Wireless/Bluetooth dongles if you get the right ones, and has enough commonality with ARM Linux (it's Debian on ARM) to have a good developer pool for unapproved apps. My next project is to set up Asterix on it and practise with VOIP, too see if I can help reduce the office phone bill. You're paying for the convenience, the simplicity and the support (that you'll rarely need with this class of device); I'm finding more and more cases where these devices are 'good enough' for a lot of SOHO and small SMB clients, and also power users such as ourselves. The nice thing about Synos range is that they scale up to monster, gazillion disk, 10GBe rackmount devices, too - all with the same interface; very handy for support purposes. Consumer NAS devices are at the stage where they can, in many cases, replace a light use Windows/Linux whitebox/OEM server for a lot of people. Simple as that. They aren't suitable for everything, but they are suitable for a hell of a lot.